I’ve finished a second Contemptor Dreadnought, they remain my least favourite Dreadnought chassis. There is something about the design I just don’t like and even with a fair bit of effort to modify them and make it more detailed and unique I’m still not happy with the end result. Anyway too the standard model and reposed all of the legs to try and make it look more dynamic. Bought a Forgeworld Power Fist and added the claw fingers. Went for the optional carapace mounted missile launcher too. So I’ve taken photos of all of my painted Dreadnoughts. The new word for these is Hellbrutes, but they’re the same thing. 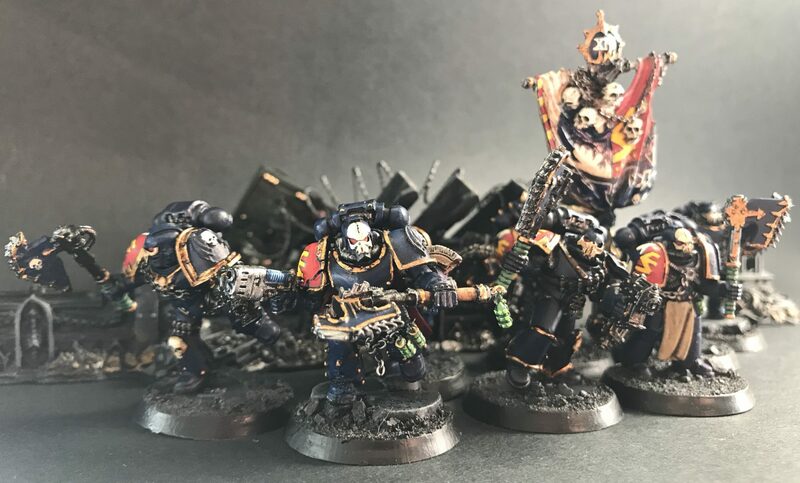 There are some classic chaos units here. Most of the ones below are from the Castraferrum Pattern. 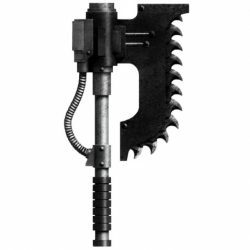 This was a Forgeworld pattern resin model although I think that the heavy plasma armament may have been off a metal model. The head on this one was really well done and adds greatly to the model. I’m please with how the spike on the back of the power fist came out. This ranged attack mode was a great sculpt and I still like it a lot. Every time I look at these photos I think that I could come back and do a bit more work on all of the figures. For example, drill out the smoke grenade launchers on the top of this one’s carapace. I think the contrast of the green missile tips works really well on this one. This Furibundus Pattern dreadnought is heavily converted fro the original model but was done so purposefully to add in some bulk and proportion. This is the model that probably needs most work. The head is too small and needs a custom sculpt to work like the Forgeworld one. I’ve been practicing my heat effect on metal barrels and think this one came out okay. When the chance to own these pair of Siege Leviathan Dreadnoughts came up I jumped at it. They were part of a larger collection now in the backlog awaiting paint, but these were the first figures I picked up to start painting. Just look at ’em. They’re huge. I’m going to adorn them with some more chaotic adornments to make them befitting of the Skull Reapers 19th Company theme but I’m going to leave them like this until I have a bit more inspiration.